Hello, sorry for the lame question but I would like to ask if I have to supply FEZ Domino with external DC power supply when I’m using DC Motor Shield with 2 motors or is the connected USB enough to power them. The USB cable doesn’t have enough power to supply to the motors…it can run domino itself but not the motors. And is the 12 V power supply (or some sort of 12 V battery) enough when I have connected two 12 V DC motors (or four of them on two motor shields) to power all motors and circuits including FEZ Domino? Also I would like to ask if I can connect brushless DC motors to motor shield. The power needed depends on the motors you use. Brushless motors are more like stepper motors and require a timed pulse to operate. I don’t believe the DC motor shield can run steppers. In the Brush Less DC motor, the electromagnets do not move; instead, the permanent magnets rotate and the armature remains static. This gets around the problem of how to transfer current to a moving armature. 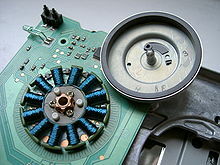 In order to do this, the brush-system/commutator assembly is replaced by an electronic controller. The controller performs the same timed power distribution found in a brushed DC motor, but using a solid-state circuit rather than a commutator/brush system. Is there a way how can I control brushless DC motor with FEZ Domino and some component? Radio Control enthusiasts uses them a lot. If you get a brushless electronic speed controller (ESC) from a hobby shop you can run the speed controller like a servo and it wil control the speed of the motor. Watch the ESC not all will provide a reverse (if you need it). The thing is that I need to control some sort of electric motors for heli or quadro copter, but don’t know if brushed DC motor is well enough suited for this job. A brushed motor will work just fine and be a lot cheaper. It has only been the in last few years that bushless motors have taken off. One of the big advantages of brushless is they last longer becuse ther is no commutator. The big disadvantage is the controller is more complicated and hence more costly. If you can afford it brushless great, but brushed motors have been working for decades. Go there read up on how they control them. beware quad heli can be addicting. Thank you for the link. As in most heli or quad copter cases they use brushless motors. I’m not very experienced with electronics and my main problem is that since brushless motor can’t be used with DC motor shield then how can I control it with FEZ Domino and .net micro framework. There is a ESC with brushless motor combination which they used (http://aeroquad.info/bin/view/Research/ESCBrushlessCombo). Now, will it be enough to buy that combo and servo controller from this site and then control it like servo motor as Craig said or do I need some additional stuff and circuits? Yes all they do is connect them to PWM pins. I have one with 9dof in it. running on a arduino. I also have 3 cracked motor mounts 2 dead motors and a vibration problem to solve before i can get it flying again. The fez servo shield or just the proto shield so you can put the 6dof and control the 4 motors. Servo shield is the thing which concerns me because in pdf is said that rotation is from 0 to 180 degrees and external power 4.8-6V however I would need full scale rotation and power supply will be probably 11.1V LiPol battery or 12V DC power supply during prototyping. Not sure if I understand you correctly, but standard servos so not have full rotation. There are special kind of servos that so full rotation. Now, what servo shield you are referring to? As chimp said, there are standard and full rotation servos. Full rotation behaves like a normal DC motor (keeps on rotating). The whole thing which I would like to do is written in reply #11. bstag said in reply #12 that servo shield would be enough to control brushless motor through PWM pins. The problem is that in pdf document is noted the rotation angle is from 0 to 180 degrees so the question is if I connect BLDC motor there would I be able to rotate it 360 degrees? Maybe the whole thing I’m talking about is nonsense and therefore I would like to know if this is possible. If servo shield isn’t at all able to control BLDC motor through PWM then what can I do or use to accomplish it. Thank you all for your help and patience with me. a “shield” is the board that plugs on top of FEZ Domino, like the DC motor shield and the Ethernet shield. If you are using a brushless motor with an ESC the servo angle has nothing to do with the rotation degree of the motor, it does represent the speed (and direction) the motor will be driven by the ESC. If you think of a servo moving a mechanical throttle on a gas engine then the rotation of the servo (not the gas engine) will move the throttle of the engine either in or out. So 0 degrees might be idle and 180 full power. With an electric motor using an Electronic Speed Controller, the ESC takes the same electrical signal that the servo does (it replaces the servo) and adjusts the motor’s speed accordingly. Most ESCs have settings to adjust min power, max power, breaking, and reverse. FYI there are ESCs for Brushed and Brushless motors. yojimbo87, you are confusing yourself with different things. To control brush-less motors, you need a “brush-less motor controller board” which we do not have on our website. The good news is that FEZ has every possible common interface so any controller you may find will probably work with FEZ. I did a quick search and looks like the brush-less controllers work the same way servos work so you can just use the servo class to control those boards. for example setting position to 0 degree will stop the motor, setting to 90 degree will make the motor go half speed and 180 degree will make the motor go at full speed. I am sure other users will benefit from this if you ever get it working so please keep us updated.